Custom version of the Salli Sway configured specifically for dental, medical, and veterinatry practitioners. Made-to-order from a wide selection of commercial-quality upholstery options. Premium chrome base. Riding-style work posture naturally corrects spinal alignment. 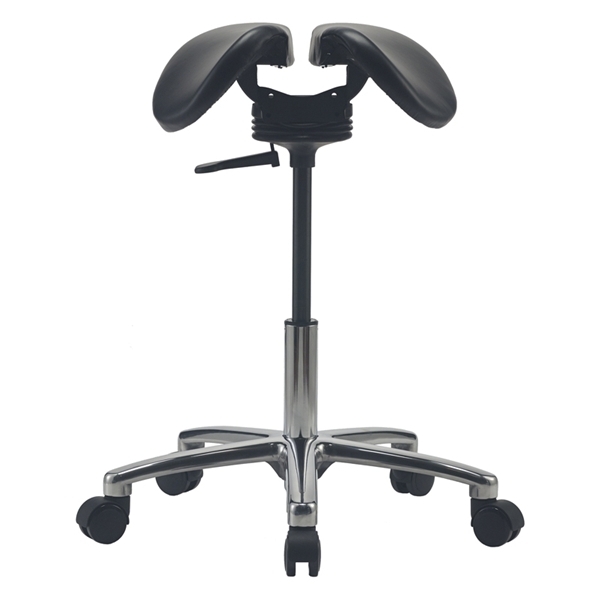 Saddle tilts 360° for easy movement. The Brewer 135DSS Saddle Stool is a custom version of the Salli Sway Saddle Chair configured especially for dental and medical professionals. The saddle seat base and dynamic seat movement are identical, however the Brewer 135DSS offers custom upholstery options and comes with a premium 5-star chrome aluminum base. A riding-style work posture naturally corrects spinal alignment and reduces muscle strain. The saddle tilts 360° allowing flexible movement and greater reach, while at the same time facilitating healthful activity in the core muscles. Patented Salli split-saddle seat is designed to improved circulation in the pelvic region, beneficial for genital health in both men and women. Anatomical saddle shape has gently sloped edges to eliminate edge pressure and increase blood flow to and from the legs. Saddle chairs naturally maintain healthy neutral spinal postures. Salli anatomical split-saddle with center gap. 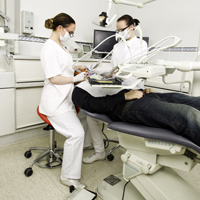 Anti-microbial professional-quality upholstery meets CA TB117 flammability requirements. CA TB133 by special order. Large 65mm (2.5") soft-wheel casters for easy maneuverability. 3 seat height options for short, average, and tall users. The manufacturer warrants this product to be free from defects in parts and workmanship under normal use and service for five (5) years from the date of delivery to original end user. The manufacturer will not be responsible for any product failure due to abuse, modification or improper use, or for any use which exceeds the published capacity of the product. Do not discard parts before contacting us for warranty service, as the manufacturer may require you to send in defective parts for examination to determine the applicability of these warranty provisions. If this occurs, you will be invoiced for the replacement part. If the part is found to the manufacturer's satisfaction to have been defective under the terms of the warranty, you will be credited the amount of the replacement part and outbound shipping costs. If the part is found not to be defective under the terms of this warranty, you will be liable for the cost of the replacement part, shipping, and/or any repair costs. This warranty is exclusive and in lieu of all other warranties and remedies whatsoever, including but not limited to implied warranties for merchantability and/or fitness for a particular purpose. No agent, employee, or representative of the manufacturer has any authority to make any affirmation, representation, or warranty not set forth in these terms and conditions. The manufacturer shall have no liability whatsoever for damages caused by transportation, accidents, fire, unauthorized alteration, or normal wear or abuse. The manufacturer will have no liability whatsoever for any incidental or consequential damages, including without limitation, lost profits or any such damages arising from (a) the design, manufacture, sale, delivery, installation, repair, operation or use of this product or any part thereof, (b) any actual or alleged failure or defect in this product or any part thereof, or (c) any actual or alleged breach or non-performance by the manufacturer of this limited warranty. Brewer professional seating fabrics are selected for quality and performance. All fabrics are commercial quality and certified to meet California's stringent flammability requirements. Tough, long-wearing, surgical quality vinyls. Can be disinfected with bleach. Luxury and durablity combine in stylish 100% vinyl upholstery. Suitable for demanding commercial, healthcare and residential environments. Abrasion resistance 500,000 double rubs (Wyzenbeek). Hampton 100% vinyl combines strength and flexibility for soft and durable upholstery. Protective topcoat provides superior stain resistance. 100% vinyl upholstery engineered for durability and style. Suitable for demanding commercial, healthcare and residential environments. 100'% vinyl upholstery with a classic leather-like appearance, Cleanable and disintefectable. Abrasion resistance 60,000 double rubs (wire screen). 100% vinyl upholstery engineered for durability. Fire retardant, antimicrobial and stain resistant. Abrasion resistance 250,000 double rubs. Brewer chairs are made-to-order. Please allow 7-14 business days production time before factory-direct shipping from Wisconsin. Volume orders may ship via truck. Truck deliveries will require someone at your location to take the products off the tailgate. If you need inside delivery, please Contact Us or type a message in the order comments area during checkout. Additional charges may apply for extra delivery services. For large industrial or factory environments, a Brewer sales representative can provide a sample stool for trial in your facility. For further information call Brewer Customer Service at 1.888.273.9371 or visit "Find A Rep" on the Brewer website. For volume orders, please contact us.